You are here: Home / Math on the go - Challenge Edition: Are we there yet? 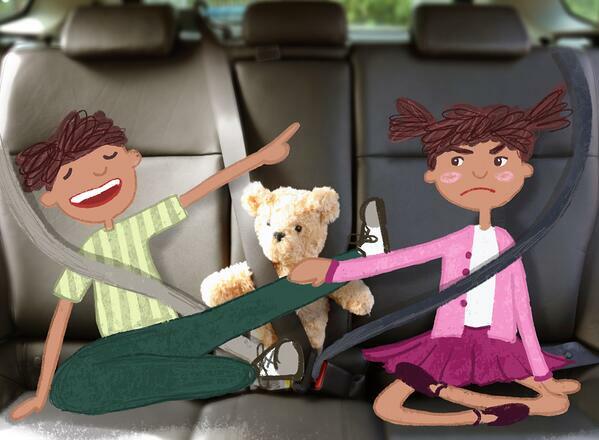 We hope this series of puzzles intrigues your children for long enough to distract them from the confines of the car. Please have fun solving ours, create your own, and share them with us! 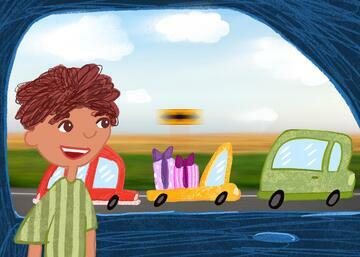 An hour ago, we noticed three cars in the following order: a red car, followed by a green car, followed by a yellow car. In the last hour, the red car was passed by the others 3 times, the green car was passed 5 times, and the yellow car was passed 8 times. In what order are those cars now? Hint: At first, it’s unclear what to do with this information. But note that the yellow car started last, yet it was passed 8 times...doesn’t that feel like a lot? Solution: Since it started last and was passed 8 times, the yellow car must have passed the others at least 8 times. This means the yellow car was the one that passed the red car all 3 times and the green car all 5 times. So the yellow car passed the others 8 times and was passed 8 times, so it ended up back where it started, as the last of the three. The red and green cars did not pass each other, so the red car remained first. Answer: The cars ended in the same order that they started. Three cars are moving in the same direction on a highway with constant speeds. When the first and second car were next to each other, the third was 6 miles behind them. When the third car caught up to the second car, the first car was 3 miles behind them. How many miles ahead of the others was the second car when the third car caught up to the first car? Hint: It might seem that the problem is messy and complicated; it’s tempting to label the cars’ speeds with x, y, and z and construct a system of equations, etc. But the problem can be simplified without this by simply observing not the speeds of the cars, but their speeds relative to each other, for instance the speeds of the second and third car compared to the first. What is the speed of a faster car relative to a slower one? In fact it’s simply the difference of the two speeds. If the faster car catches up or overtakes the slower one, that relative speed measures how quickly the distance between the cars changes in a unit of time. That is, for a passenger of one car, this is the speed at which the other car is approaching or passing. Solution: The third car was behind the others at first; next it caught up to the second car, and the first was behind them. Thus, the third car is faster than the second, and the second is faster than the first. At first, the third car was 6 miles behind the other two, which are at the same point, and later the second and third car are 3 miles ahead of the first. Between these points, the third car has traveled 9 miles more than the first, and the second has traveled 3 miles more than the first. Thus, we conclude that the speed of the third car relative to the first car is three times more than the speed of the second car relative to the first car. So when the third car catches up to the first, closing a gap of 6 miles, the second car has traveled 6 /3 = 2 miles away from the first. Tom is on a school bus that is moving at a constant speed of 40 mph from station A to station B. He sees one car pass the bus each minute; each car is going at the speed limit of 60 mph. How frequently does a car pass by station B? Hint: At first glance, isn’t it the same thing for cars to pass Tom’s bus or the station? It seems like it should be the same answer: once a minute. Let’s look more carefully: we haven’t used the given speeds of the bus and the cars at all; are these just extraneous information? Consider what will happen if the bus speeds up; in particular, consider the case where the speeds of the bus and cars are the same. Then no cars will be passing Tom at all, but they will be passing station B all the same. So this theory doesn’t hold up. Let’s consider a different case. 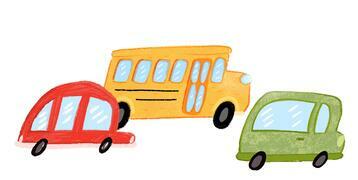 Maybe the speed of the bus is slower than the cars’ speed, but not by much. The cars will pass Tom, but rarely, since it will take longer to catch up to the bus. But they will pass the station at the same time intervals as before, regardless of the speed of the bus. This is the key to the problem: the speed of the cars (60 mph) is different from the speed of the cars relative to the bus (60 - 40 = 20 mph). Solution: When one car passes the station, the next one is a certain distance s away. This distance between cars remains constant at s throughout the journey, since their speeds are the same. So we can simplify the question to determining how long it takes for a car traveling at 60 mph to travel this distance s.
When a car passes the bus, the next one is s behind. We know that second car’s relative speed to the bus is 20 mph, and we know it will catch up to the bus in a minute. That is, a car traveling at 20 mph covers s in a minute. Thus, a car at 60 mph will cover the same distance three times faster: in 20 seconds. Now, as usual, you can use your imagination, and create as many puzzles as you want, on your own! See two more, just for inspiration. You are an experienced problem solver now, so we won’t provide solutions. 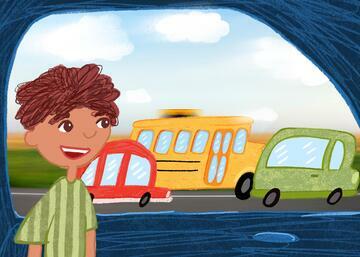 A school bus is approaching its stop; Tom is inside the bus and Sid is waiting at the stop. Traffic is moving along the road in the same direction at 60 mph. Cars are passing Tom every two minutes, and they are passing Sid every 30 seconds. At what speed is the bus moving? Tom is in a car with his parents and is now passing buses himself. Buses follow a strict schedule and reach the nearest station every seven minutes. Tom passes a bus seven minutes after he passed the previous one. How many times faster is the car going than the buses?